A New Year’s resolution you can carry out is to visit one of the nearby national parks with which our region is so richly blessed. One of the best for winter months is the South Rim of the Grand Canyon. A New Year’s resolution you can still make and carry out is to visit one of the nearby national parks with which our region is so richly blessed. One of the best for winter months is the South Rim of the Grand Canyon. It’s not very far, and this time of year, it’s not very full of visitors. Yet, with its usual light winter blanket of snow, the South Rim is at its most beautiful. Enriching the appeal, the entrance fees are waived Saturday through Monday for the Martin Luther King Jr. holiday. If you come to hike, as I do, the South Rim offers mild exercise, in short walks along segments of the 13-mile-long Rim Trail. But it also offers greater adventures and more strenuous exercise with trails into the canyon itself. For either option, bring your warmest clothes, for the rim is 7,000 feet above sea level. If you plan on doing any hiking below the rim, also bring along a pair of over-the-shoe traction devices, such as STABILicers or Yaktrax, and a pair of sturdy hiking poles because the upper reaches of the trails this time of year can be hazardous with snow, ice or both. Challenging, but one of the best for a winter hike, is the Bright Angel trail, which begins just west of the Bright Angel Lodge. 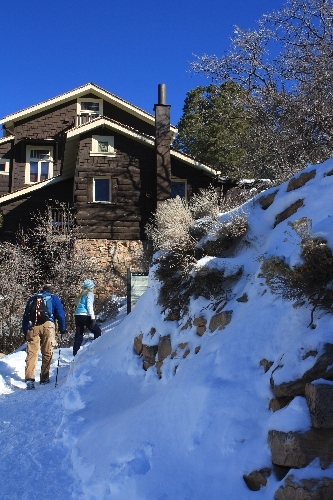 For a day hike, one good destination is the Mile-and-a-Half Resthouse, which takes you down into the canyon from 6,820 feet to 5,729 feet, a three-mile round trip. Allow at least two to three hours for this hike in winter. Hiking to Three-Mile Resthouse is a six-mile round trip from the rim and usually takes four to six hours to complete. You’ll descend to 4,748 feet, so remember that return trip is all uphill, and it often takes twice as long as the descent. Even if you venture just a short distance on Bright Angel Trail, you’ll enjoy it. Just a few hundred yards from the trailhead, you pass through a man-made tunnel in the rock. Once through this passage, look high on the cliff to your left to see a shallow alcove called Mallory’s Grotto. It contains red pictographs of elk, which you will be able to see from the trail. Bring your binoculars for an even better look. You will probably run into some wrangler-led mule trains carrying visitors down or up this trail. Unless you are instructed differently by a wrangler, proper etiquette calls for hikers to stand quietly off to the uphill side of the trail and remain there until the last mule is at least 50 feet away. Through Feb. 29, you can also drive your personal vehicle out to Hermit’s Rest. The rest of the year this trip is allowed only by shuttle bus. It is an incredible seven-mile drive with a multitude of viewpoints. Hermit’s Rest is a building built in 1914 and is a National Historic Landmark and a good place to warm up by the fireplace. Another good road trip is the 25-mile Desert View Drive. There are plenty of places to pull over and get alternate views of the canyon. You can also stop at the Tusayan Museum and Ruin and then stop at the Desert View Watchtower. You can climb the 85 steps for a full panoramic view from the top. 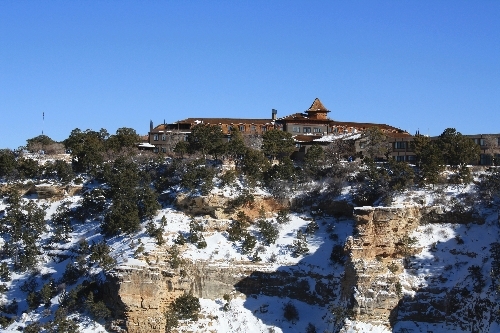 Even in winter, the South Rim has plenty of accommodations, and most services, including ranger-led programs, are running. If you are fortunate enough to be in the park after a fresh snowfall, look for animal tracks. Deer and elk are often seen this time of year. You also might find mountain lion, bobcat and coyote tracks.